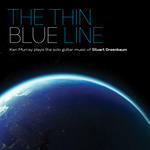 Thin blue line / Ken Murray plays the solo guitar music of Stuart Greenbaum. Rushall express : for solo guitar / Stuart Greenbaum. Chamber music sampler / Stuart Greenbaum. First performance: by Ken Murray — 21 Jun 97. Monash Uniting Church, North Clayton, Vic. 21 Jun 97: Monash Uniting Church, North Clayton, Vic.. Featuring Ken Murray.